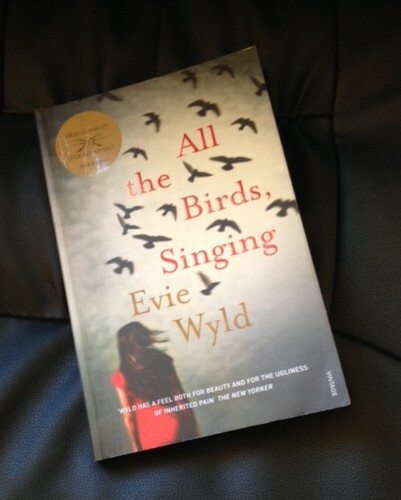 All The Birds Singing is a beautifully crafted story about a girl called Jake and a tumultuous life that takes her from coastal Australia, to outback Australia, to a remote island off the coast of the United Kingdom. It’s a life that is, for the most part, ugly and painful, but that is also peppered with moments of love and, albeit very small, moments of happiness. Before you tune out because this all sounds too depressing, trust me when I say this is an incredibly worthwhile and rewarding read. The book is structured around two timelines: all of the odd chapters follow a chronological present, while every other chapter tells the story of Jake’s past, in reverse order. In other words, the beginning of the odd chapters, which is present day, also marks the end of the even chapters, or the end of the past. Got it? Although it sounds confusing, (probably my fault for the inelegant way I’ve explained it), I thought this was a great way of revealing how the events of the past had led Jake to the events of the present. And by having the chapters in the past follow a reverse order, Wyld was able to create a certain amount of suspense around the events and actions that led Jake to her current situation. While I loved the structure, one of my main criticisms about the book is that I felt the gap between the end of the past and the beginning of the present was too large, and there were too many things left unexplained. I found that this lack of explanation rendered a few of the events meaningless – when I finished the book and was thinking back to some of the situations Jake found herself in I couldn’t help but think ‘what purpose did that storyline serve?’. The other big issue for me was that the ending of the book left me kinda cold, and that affected my initial reaction to the book in general. Despite these reservations, I really enjoyed All the Birds Singing. I thought the writing was stunning and the way Wyld was able to evoke the feeling of being in Australia was superb, particularly for someone who hasn’t been to Australia as an adult. All of the scenes on the sheering stations and in outback Oz felt really genuine and some of the descriptions were almost palpable – I could feel the layer of grit on my skin and smell the blood of freshly slaughtered sheep. While I would whole-heartedly recommend this book to anyone who enjoys lit fic, the recommendation also comes with a warning – you are going to want to discuss this with someone as soon as you finish it, so make sure you have a friend lined up for a gab session. And if you don’t, feel free to email me – I have lots of questions that need answers. Great review 🙂 I love the way Evie Wyld writes – like you say, the way she evokes Australia is very well done. I really liked the structure of the novel with the two timelines, I thought it was an effective way of revealing Jake’s character to us. I definitely need to reread this one as it’s been a while since I first read it! Thanks! Have you read any of her other stuff? Any recommendations? I also thought this book was stunning. I loved the book too. I’m puzzled about the scars on her back. Did I miss something? Was this explained? The earring? There were SO many things left unexplained. It was so long ago that I read it that I can’t remember about the scars, but I’m sure they were explained…did they have something to do with the fire? Was there a fire? god, my memory is terrible!! All explained now – at book club meeting last night. Apparently she got caught after the fire she accidentally lit in which Flora and Denver were killed and seriously wounded respectively. Her t-shirt was ripped off and she was flogged (or branded). Thanks so much for your reply.